Hungary is a landlocked country of central Europe. 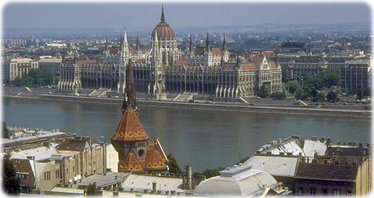 The capital is Budapest, it is also the cultural and economic center of Hungary. Other Hungarian cities include Debrecen, the trade center of a major agricultural region on the Great Plain; Miskolc, the location of iron-and-steel and other metallurgical industries; Szeged, a shipping center on the Tisza for the agricultural products of the Great Hungarian Plain, also noted for its chemical and synthetic-textile industries; and Pécs, home of small manufacturing industries. About 90% of the Hungarian people are Magyars, descendants of the Finno-Ugric and Turkic tribes who mingled with Avars and Slavic tribes in Hungary in the 9th century. The country’s largest ethnic minorities are Roma (Gypsies), Germans, Slovaks, Romanians, Croats, and Serbs. A law passed in 1993 permits ethnic minorities to set up self-governing councils. Hungarian, also called Magyar, is the official language of Hungary. It is a member of the Ugric branch of the Finno-Ugric languages and it is completely unrelated to any of the major European languages of the Indo-European language family. Hungary is predominantly a Roman Catholic country with a large Protestant minority. During the Communist period, the government dissolved most religious orders and seized the properties of the monasteries. Those religious bodies that remained were controlled by the State Office for Church Affairs. About 2/3 of the current population is Roman Catholic and about 1/4 is Protestant, the chief Protestant groups being the Hungarian Reformed church and the Hungarian Lutheran church. The Orthodox and Unitarian churches are also active. Despite large-scale urbanization in the area surrounding Budapest, Hungary is best characterized by its rural nature. Cities are surrounded by settlements with scattered multilevel apartment buildings. In the early 1990s, after the fall of Communism, living standards fell for most of the population as a result of the country’s economic transition to capitalism. Hungary made a fairly rapid transition from state-owned to privately owned businesses, and wages rose in the late 1990s, as did the standard of living. The Danube river in Budapest and the Parliament (center). Budapest, capital and the largest city of Hungary, located on both banks of the Danube River. It is the country’s cultural and industrial center. Three towns, Pest, Buda and Óbuda, was combined, in 1873, to form the capital of the newly autonomous Hungary. Hungarians use the nickname “Pest” to refer to the city. The ancient Magyars had a rich folk culture, which incorporated Eastern themes into its folktales, art, and music. Following the Hungarian conversion to Christianity in the 10th century, pagan and Eastern cultural elements were replaced by Western cultural and social patterns, and Latin, the language used by the Roman Catholic Church, became the official and literary language. This meant, especially during the Middle Ages, that the overwhelming majority of chroniclers, scholars, and educators in Hungary were priests. During the 15th century Italian artists and scholars flocked to the court of King Matthias Corvinus and introduced the humanistic Renaissance into Hungarian culture. In the 16th century, during the Reformation, the Hungarian language replaced Latin. From the 15th through 17th centuries a politically based cultural idea developed of Hungarians as the “protecting bastion of Western civilization” against the Ottoman imperialism. This idea survived into the 20th century. In the 18th and 19th centuries Hungary absorbed the ideas of the Age of Enlightenment and of Western European liberalism. New movements arose as a result. The Hungarian Academy of Sciences, founded in 1825, was highly influential in assimilating these ideas into Hungarian culture. In the last quarter of the 19th century Hungarian Jews also greatly influenced Hungary’s cultural life. Copyright © Geographic Guide - European countries. Ungarn, Hongarye, Hungario, Hongrie.